First time having Five guys and was impressed. Did the online ordering and like how you can customize your burger. Got small fries which can feed a few people. Will definitely be back. Knowing the standard of Five Guys in other places, this joint leaves a lot to be desired. The ordering process was hasty or pushy, indicating that they are short staffed and stressed. This was confirmed as it was the same guy taking the orders, frying the paddies, making the fries and handing it out. Other FGs may have four people doing this. As a result the paddies were well done / "cremated" with no juices left, accompanied by dark dry over cooked fries. Guys - you can do better ... management: staff up, or close down ! Burgers, fries and peanuts in the shell! What's not to like? The burgers are made fresh, not sitting around or microwaved. It means a bit of a wait, but not that big a deal when you're munching on the peanuts. Fries are very, very good. Portions are extremely plentiful. Soft drinks are serve it yourself, so they're unlimited. Staff is friendly and very accommodating. 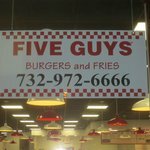 Been to Five Guys? Share your experiences!